Your smile is important! It’s one of the first things people notice when they meet you. A bright and white smile looks healthy and youthful, and yet, according to an American Academy of Cosmetic Dentistry national survey, 50% of the people surveyed were not satisfied with the appearance of their own smile. What Causes Teeth Stains and Discoloration? Professional Take Home Whitening can often remove these stains resulting in a brighter and whiter smile. Regular hygiene appointments at Cornerstone Dental are recommended to help reduce the effects of lifestyle habits that can cause staining or yellowing of the teeth. If you’re due for a checkup and dental cleaning, we welcome you to book (you’re) your hygiene appointment today. 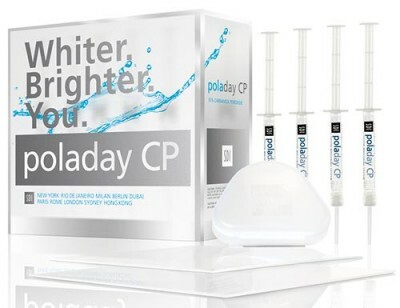 At Cornerstone Dental’s Okotoks Dental Office we use the PolaDay Whitening System by SDI. It contains a 7.5% solution. It should be used once or twice a day for 30 minutes at a time. Do not exceed 45 minutes per wear, as this may cause sensitivity. If you are prone to sensitivity, start brushing with a sensitivity toothpaste two weeks before starting your whitening treatment. You are in control of the whitening process. Once you reach your desired result, you should stop the treatment. Teeth are naturally dark along the gum line. These areas may require more time to lighten than the rest of the tooth surface, and may remain slightly darker. 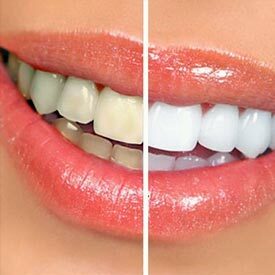 Also, fillings and crowns will not change color with whitening products. Brush teeth with sensitivity toothpaste. After treatment, remove whitening tray. Rinse whitening tray with cold water and rinse your mouth with lukewarm water. Keep gel at room temperature, store in a cool, dark area. Patients who experience sensitivity may need to modify their treatment schedules such as taking a day or two breaks between treatments. Fewer treatments are also suggested when sensitivity is an issue. Patients will also be given a tube of Sensodyne Repair and Protect Toothpaste which helps reduce sensitivity. Patients with a history of chemical allergies are advised to have an allergy test done before using this product. Stop use and call our office if any reactions do occur. Ingestion of Large Amount (half syringe or more): Drink plenty of milk or water and seek medical advice. Call Cornerstone Dental at (403) 995-1800 to request your PolaDay Teeth Whitening appointment today.